For decades, every presidential candidate has vowed to “fix” social security, yet it never happens. In the meantime, workers have money deducted from their paychecks and retirees get paid. Is the system really broken? In a word – YES! While the politicians fiddle, the system continues to deteriorate. 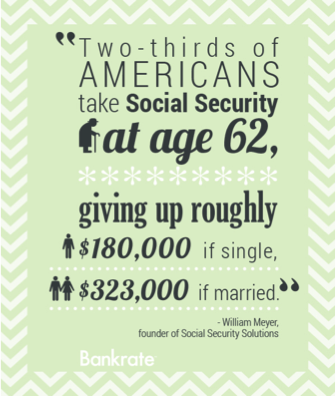 The challenge becomes more difficult because there is so much misinformation about Social Security. Here is just one example. A recent Bankrate article “Boost Social Security Income”, includes the following “no-brainer” chart. While the math may be technically accurate, I take great exception to the “no-brainer” implication. Only a fool would want to give up anywhere from $180,000 to $323,000 dollars. Recently, good friend David Holland, CFP, CPA, published a great article, “Robos Aren’t Social Security (SS) Superheroes” addressing the subject. While computers can assist with “crunching the numbers”, the decision about when to take Social Security is much more than basic math. I contacted David, and he agreed to sit down for an interview. David deals with the real world, not theory. He is in the trenches everyday, working with clients of all ages, addressing not only Social Security, but also building a financial plan to deal with the deficiencies and uncertainties of the current system. DENNIS: David, thank you for taking the time to help our readers understand the tough decision about when they should be taking Social Security. I’d like to ask you about the “Robo-Adviser” part of your article. Can you explain to our readers what that is all about? DAVID: Dennis, thank you for inviting me. I applaud your “pushing back” on the “no-brainer” pitch about Social Security. Ironically, it is this kind of commentary that makes it more difficult for thoughtful, deliberate retirees and pre-retirees to choose the best Social Security timing method and filing technique for their situations. We don’t need computer software or a robot to tell us what is common sense: if you delay drawing on your Social Security until age 70 and then live a very long time, you’ll get a lot more money than if you filed at age 62. However, for many Social Security recipients, such a strategy is unrealistic or inappropriate. DENNIS: You mentioned human elements or personal circumstances. Can you give some examples and how they factor into the decision? DAVID: Social Security planning software can be a helpful tool in looking at the various “what if’s” for when people choose to start drawing their benefits, especially for married couples. However, even though planning software has gotten very good and I use it routinely, the final decision on when and how to take Social Security still needs to be considered as part of an overall financial plan. 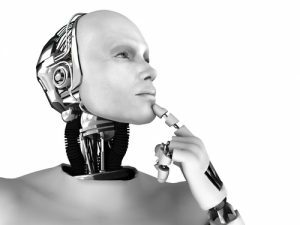 A lot of noise has been made in the financial industry about “robo-advisers” and their low-cost ability to manage investment portfolios. Frankly, I think it is way overblown. My firm uses a “robot” or software to run investment reports and to assist us in allocating our clients’ investment accounts, but the software doesn’t do this on its own. We also don’t allow the “robot” to automatically re-balance portfolios on their own. Judgment is required. Human judgment. The same is true of Social Security planning. One of the most advanced computing systems on the planet is IBM’s Watson. I hear it is “smart” and has a growing “artificial intelligence.” That’s great. I’m sure it could beat me on Jeopardy! It’d be a different story, however, when it comes to personalized financial planning and the decisions about Social Security. As a well-trained human with ears, eyes and a heightened understanding of people, my ability to interface and interact with clients is far superior to that of a robot. To arrive at the “right” recommendations for how and when to take Social Security, I can simultaneously assess both the financial and non-financial factors for a client. I can hear a client’s concerns, family history, income and lifestyle needs, their need for flexibility, and their desires to leave money to heirs. I can also weigh their financial resources and consider the range of investment and financial products available in the marketplace. With all this in my head, I can then develop the most appropriate financial planning recommendations, including Social Security choices, for each individual client. The best robot on the planet can’t do all of this. Maybe in a hundred years it could, but not today. DENNIS: I’m very concerned about future inflation eroding the buying power of a retiree’s Social Security check. Our 2017 monthly checks total $2/month less than it was in 2014. While the law requires Cost of Living Adjustments (COLA), the increased costs for medical care are taking it all away. David, I am a believer that your first Social Security check will have the most buying power, and from that point forward, it will be reduced by inflation. How do you advise your clients to protect themselves from inflation in their retirement? DAVID: While inflation has been tame in recent years, I’m sure your readers don’t need to be reminded of how savage a beast inflation can be. I agree with your point about the “value” of Social Security checks. Yes, delaying Social Security will provide higher checks in the future. We get that, but there are consequences to that decision. First, inflation may accelerate and, thereby, make those future dollars worth a lot less. Second, Social Security benefits can be changed, resulting in your not getting what you were waiting for and planning on. DENNIS: I know you are familiar with the theory that any changes made to Social Security will affect younger workers. Those already receiving benefits will be “grandfathered in”, meaning their benefits will not be changed. David, there’s a bill in a congressional committee advocating less generous Cost of Living Adjustments (COLA) and means testing, reducing benefits for wealthier retirees. Good intentions notwithstanding, if Congress does truly address fixing the system, there are no guarantees that existing retirees will not see benefit reductions. As you said earlier, robo-advisers work on a database of historical data. Somewhere, human judgment and individual circumstances come into play; the future may be different than the past. Are some of your clients concerned about future benefit reductions? How do you advise clients to work around it? DAVID: Yes, Dennis, I often hear clients express their concerns about future Social Security benefits. Again, this is where the robot can’t make the final Social Security recommendation. Let’s say, for example, someone is very anxious about drawing their benefits. Waiting the four years from age sixty-six to age seventy to “max-out” their Social Security might make financial sense for them, but if they will be “stressed-out” each day of the 1,461 days they would have to wait, what is the point? That’s no way to live. And, if they have a heart attack and die before collecting a nickel in benefits, it will be all for naught. I know this is an extreme example, but the robots wouldn’t “get” this part of the Social Security decision. We humans can. DENNIS: David, you hit on a very important point. Some people don’t realize the decision is a bet on your personal longevity. If you defer benefits, you will get increased benefits in the future. As you said, you could die before collecting a nickel. The breakeven point is somewhere around your 80th birthday. To lose the kind of money outlined in the Bankrate article, you would have to live until almost 90 – assuming there are no changes in the program, as it exists today. If a person lives well beyond their normal mortality, they could benefit greatly by deferring their benefits. No matter how hard Watson tries, the program cannot read the minds of a congress trying to save the system, or accurately predict the life expectancy of any single individual. To me, the health of the client, and his/her mindset are very important factors. How do you deal with that on an individual basis? DAVID: Dennis, I agree with you. I feel it is my job to explain all the facts – not just the math. For most, the decision is irreversible, and they need to have a clear understanding. Clients must decide what they feel is the right decision for them. Once they do, I tell them to never look back. DENNIS: David, on behalf of our readers, thank you for your time. Dennis again. Regular readers know I am a believer in using all the tools available for evaluation and making decisions. That is much different than having a computer make the decision for you. When it comes to Social Security, find a Certified Financial Planner practitioner with experience and training on the subject and hire them to give you personalized advice. Make sure they give you all the facts, not just the math. It’ll make Watson jealous! Last week we enjoyed a visit with the youngest grandchildren, Brock (7) and Braidyn (12). While they loved Tombstone, they both felt touring Kartchner Caverns was the event they enjoyed the most. The story behind the discovery, and how it was kept a secret for years is very interesting. Driving the family back to the airport, I pointed out our little town has a new Freddy’s restaurant. We were all surprised to see four people on horseback going up to the drive through window. Another reminder we are in Arizona. I wish I had stopped to take a picture. Congratulations to North Carolina on winning the NCAA basketball tournament. The tournament is also a reminder that the baseball season is beginning. Last week I introduced my latest FREE report, “10 Things You Need To Know, That Brokers Won’t Tell You About Dividend Paying Stocks!” To download this FREE report, click HERE. Some “Great Truths adults have learned” from friend Jeff W.
Raising teenagers is like nailing Jell-O to a tree. Laughing is good exercise. It’s like jogging on the inside. Mature adults choose their cereal for the fiber, not the toy.